What is the Meaning of Enfield? Know Your Royal Enfield Better !! 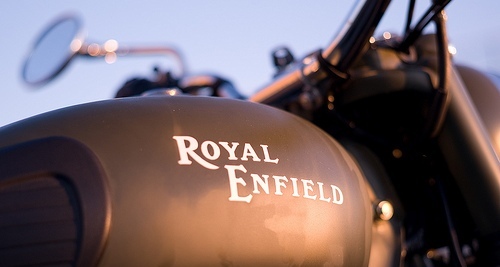 In a discussion board, someone said "I thought Royal Enfield was the field where the Queen kept the 'ens". So what is the real meaning of Enfield? "Enfield was recorded in the Domesday Book 1086 as Enefelde, Einefeld 1214, Enfeld 1293, Enfild 1564, that is 'open land of a man called Ēana, or where lambs are reared', from the Old English feld with an Old English personal name or with Old English ēan 'lamb'. The feld would have been a reference to an area cleared of trees within woodland later to become Enfield Chase." The word Enfield also has a meaning in heraldry, it is a mythical beast having the head of a fox, the chest of a greyhound, the body of a lion, the hindquarters and tail of a wolf, and forelegs like an eagle's talons. The origin of the word in this context is disputed. There even is an Enfield Society on the topic!